A new study is the first to systematically assess multiple pesticides that accumulate within bee colonies. The researchers found that the number of different pesticides within a colony—regardless of dose—closely correlates with colony death. The results also suggest that some fungicides, often regarded as safe for bees, correlate with high rates of colony deaths. The study appeared online September 15, 2016, in the journal Scientific Reports. "Our results fly in the face of one of the basic tenets of toxicology: that the dose makes the poison," said Dennis vanEngelsdorp, an assistant professor of entomology at UMD and senior author on the study. "We found that the number of different compounds was highly predictive of colony death, which suggests that the addition of more compounds somehow overwhelms the bees' ability to detoxify themselves." The researchers followed 91 honey bee colonies, owned by three different migratory commercial beekeepers, for an entire agricultural season. The colonies began their journey in Florida and moved up the East Coast, providing pollination services for different crops along the way. They also spent time in locations meant for honey production, as well as "holding areas" where beekeepers prepare large numbers of colonies for upcoming pollination contracts. A total of 93 different pesticide compounds found their way into the colonies over the course of the season, accumulating in the wax, in processed pollen known as bee bread and in the bodies of nurse bees. At every stop along the beekeepers' itinerary, the researchers assessed three different parameters within each colony: the total number of pesticides; the total number of "relevant" pesticides (defined as those above a minimum threshold of toxicity); and each colony's "hazard quotient," a measure devised by other researchers to integrate the total hazard posed to each colony by the cumulative toxicity of all pesticides present. All three measures correlated with a higher probability of colony death or queen failure. In addition, the researchers found between five and 20 different pesticide residues in every sample of bee bread that exceeded a hazard quotient's safety threshold. The highest number of pesticides accumulated in the colonies early on, shortly after beekeepers placed colonies into early season flowering crops like apples and blueberries. Honey production stopovers and holding areas offered the bees some respite from further contamination. 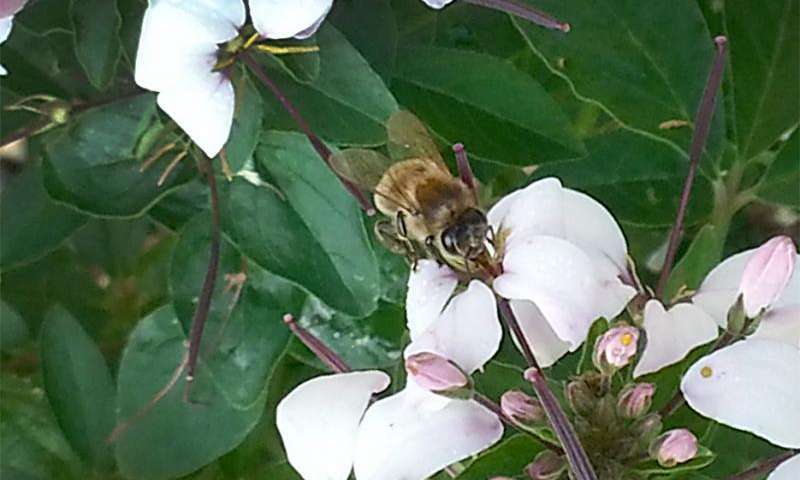 "We were surprised to find such an abundance of fungicides inside the hives, but it was even more surprising to find that fungicides are linked to imminent colony mortality," said Kirsten Traynor, a postdoctoral researcher in entomology at UMD and lead author on the study. "These compounds have long been thought to be safe for bees. We're seeing them at higher doses than the chemicals beekeepers apply directly to the colonies to control varroa mites. So that is particularly concerning." The current study borrows a concept from human cancer research: the "exposome," or the sum total of chemicals an organism is exposed to over its lifetime. But instead of looking at individual bees, the researchers assessed each colony as a single "superorganism" that functions as a single, cohesive unit. 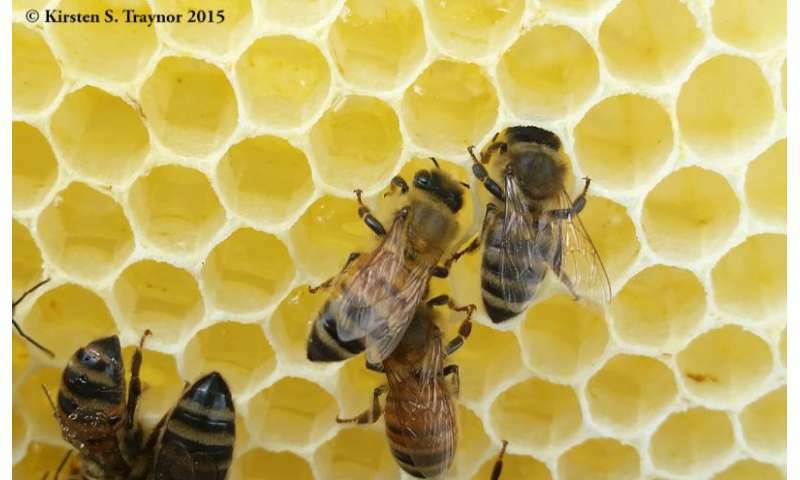 "This is a huge problem for beekeepers currently. Not long ago, a queen would typically last up to two years. 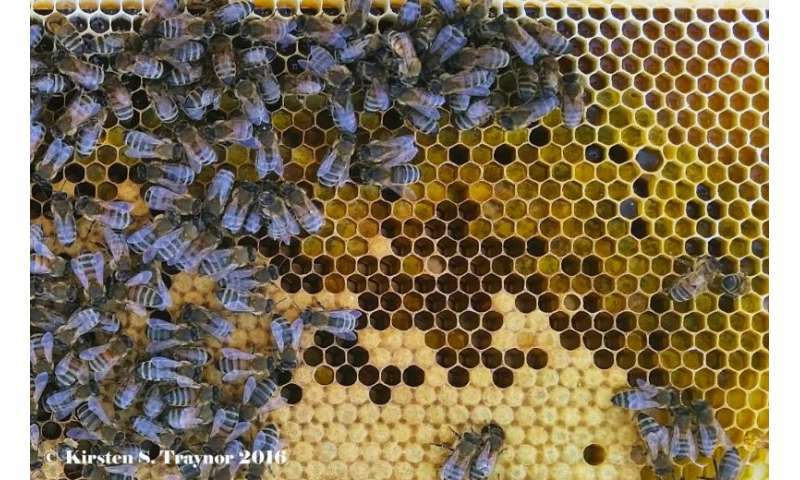 But now many commercial beekeepers replace the queens in at least half of their colonies every spring in the hopes that this will prevent premature queen deaths," Traynor explained. "Even with such measures, many queens still don't make it through one season." "We just did not find neonicotinoids in the colonies," vanEngelsdorp explained. "There were some trace residues of neonicotinoids in a few samples, but not nearly on par with other compounds. However, it's possible we did not test the right matrix—we did not test nectar, for example—or that the product breaks down faster than others in the collection process or that neonicotinoids are simply not very prevalent when crops are flowering." "We have to figure out ways to reduce the amount of products that bees are exposed to while still helping farmers produce their crops," vanEngelsdorp said. "This will require careful examination of spray plans, to make sure we only use the products we need, when we need them, in order to reduce the number of products bees are exposed to while pollinating different crops." Rubbish. Bee colony collapse is linked to two things which coincide with the decline in bee populations. 1. The ceasing of use of pesticides in many Western environments which helped control parasitic mites that kill bees. 2. The conversion of flowered areas in cities to "wild" growth, which is also linked to pesticide use. The discontinuance in use of pesticides makes flower gardens vulnerable to pests. For example, without pesticides, rose gardens are basically impossible to keep, pests destroy them.